Each GP Letrozole tablet contains 2.5 mg of Letrozole. 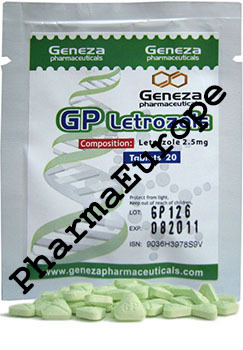 GP Letrozole is available in a sachet of 20 tablets. GP Letrozole is often prescribed to postmenopausal women to have estrogen levels lowered in their body. This way the drug acts on the breast tumors which need estrogen to grow and slows down the rate of their development. Letozole is primarily prescribed to postmenopausal women who are in the process of undergoing breast cancer treatment. Moreover, women who have already been taking tamoxifen (GP Nolvades) for the past five years are also often prescribed this drug. GP Letrozole (Femara) is an oral non-steroidal aromatase inhibitor that has been introduced for the adjuvant treatment of hormonally-responsive breast cancer. Estrogens are produced by the conversion of androgens through the activity of the aromatase enzyme. Letroplex blocks production of estrogens in this way by competitive, reversible binding to the heme of its cytochrome P450 unit. The action is specific, and Letroplex does not reduce production of mineralo- or corticosteroids. In contrast, the antiestrogenic action of tamoxiplex, the major medical therapy prior to the arrival of aromatase inhibitors, is due to its interfering with the estrogen receptor, rather than inhibiting estrogen production.